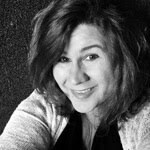 This post is sponsored by the Idaho Potato Commission in conjunction with a social media campaign through Sunday Supper LLC. All opinions are my own. This dippable appetizer is made with sour cream, cheddar cheese, BACON, potatoes, and chives too! Everything you expect on a loaded baked potato, so naturally it tastes just like those comforting loaded spuds I sometimes like to enjoy for dinner, only better, because you eat it on CHIPS! AmIRight? You know it! To ensure a lip-smacking good dip, I always use the best quality and freshest ingredients I can get my hands on. My favorite cream cheese, sharp cheddar that I shred myself, thick-cut bacon, fresh chives, and Idaho® potatoes are a must for me. Idaho's unique growing season of warm days and cool nights, water straight from the mountains, and rich volcanic soil give Idaho® potatoes their exceptional texture and taste. You know you're getting the best of the best in potatoes when you see the "Grown In Idaho" seal. 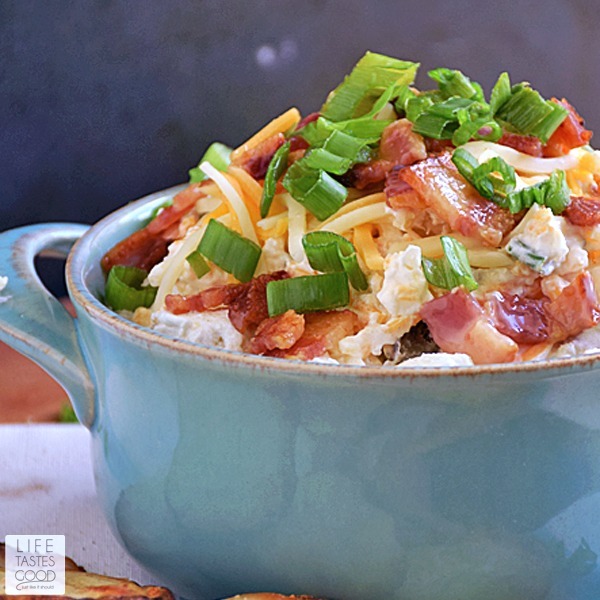 To make this crave-able dip I used one Idaho® russet potato and baked it in the microwave, because I couldn't wait to get this Loaded Baked Potato Dip in my belly, and the microwave made quick work of baking my potato. You can absolutely bake it in the oven if you like. I let the potato cool so my delicate little fingers could handle it, and then chopped the potato up into bite-sized pieces. I left the skin on, but you can remove it if you prefer. 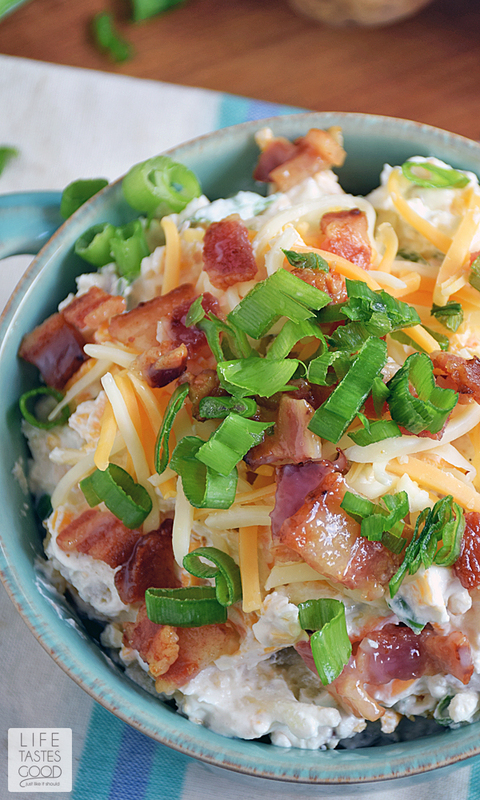 In a mixing bowl I combined the baked potato with sour cream, shredded cheddar cheese, chopped bacon, and chives. You can serve this up right away and enjoy with your favorite potato chips. 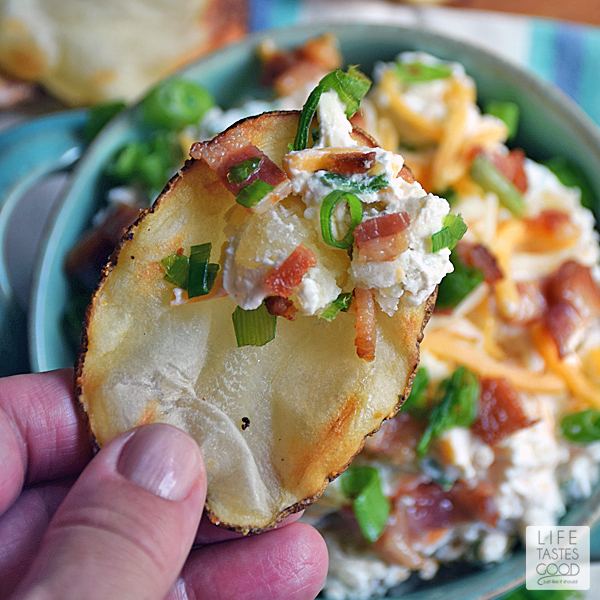 Home baked Idaho® potato chips made the perfect dipper for this tasty appetizer and they are super easy to make too. Be sure to scroll down past my recipe for links to all of our #SundaySupper recipes featuring Idaho® Potatoes, and follow the #SundaySupper Idaho® Potato Pinterest Board for even more tasty bites. 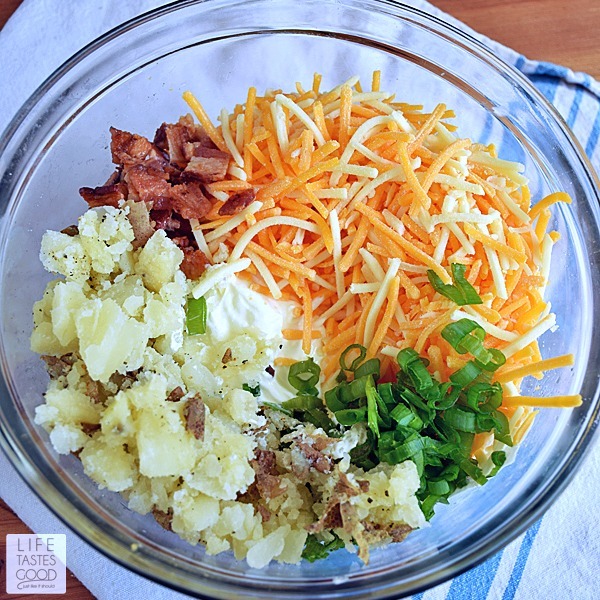 In a mixing bowl, combine the baked potato with 16 ounces of sour cream, 2 cups shredded cheddar cheese (reserve a tablespoon for garnish), chopped bacon (reserve a tablespoon for garnish), and the chives (reserve a tablespoon for garnish). Mix well. When it is just right, transfer the dip to serving dish and garnish with the reserved cheese, bacon, and chives. Serve with potato chips and enjoy! A party in a bowl for sure! 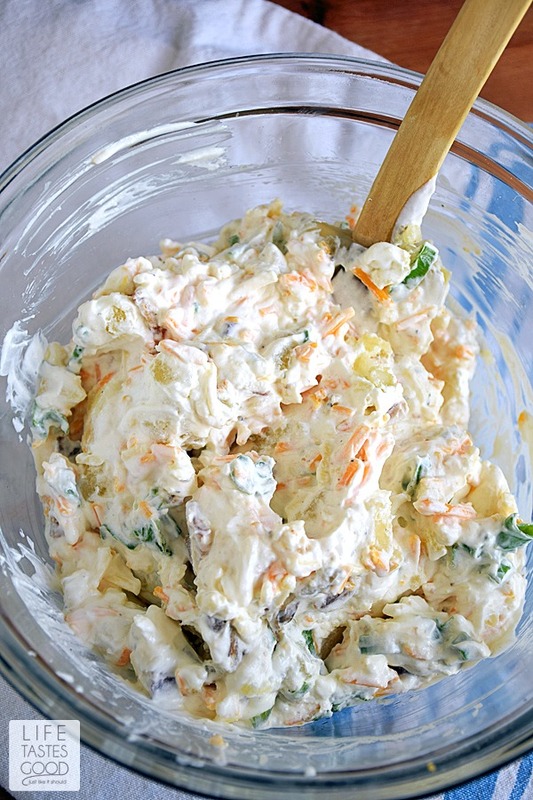 Love this delicious dip and all the lovely flavors!So yum! I'd love to eat this dip with a big spoon! Sounds delicious!! 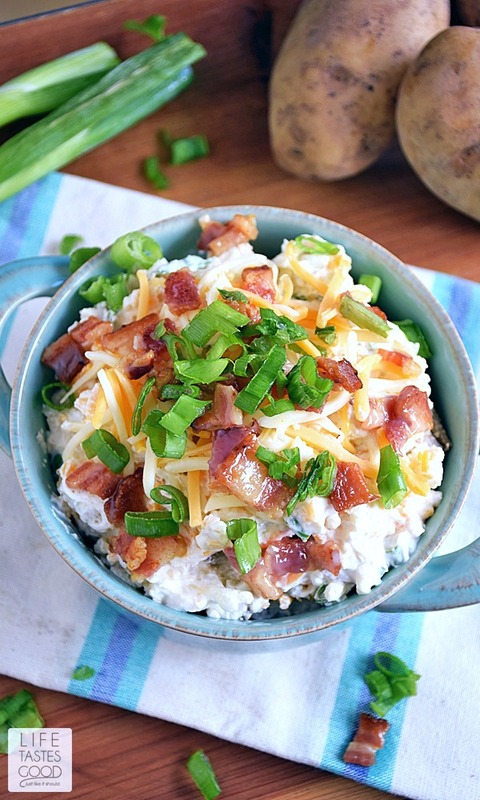 I cannot wait to make this dip!!! It will be a hit for sure!!! OhhEmmGeeeee I need this dip in my life ASAP!! My kind of dip and chips! Good Lord, I'm looking at this right now and thinking, This would make a good breakfast. lol Looks Yummy! I am in love with this dip...it looks incredible! Now this is clever! 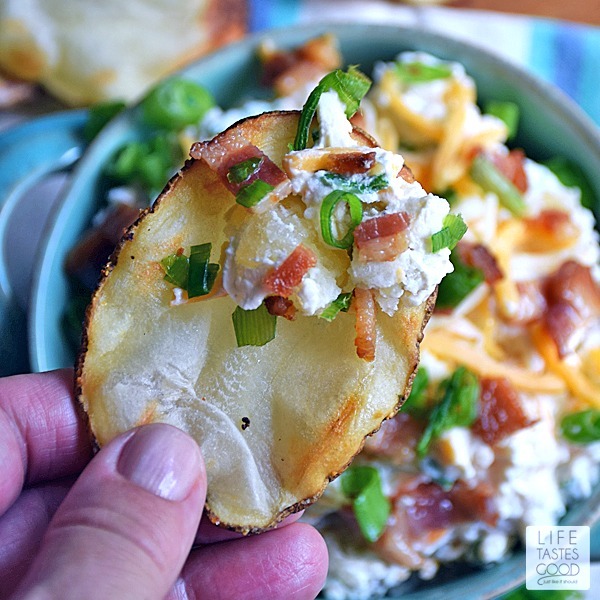 I love loaded baked potatoes ... and this is a great way to put a spin on it! This looks out of this world amazing! So tasty!